This book was a Christmas present. I always make an effort to finish gift books, and I usually do because it’s the thought that counts, but this one was difficult to get through. I think it comes down to the book being not right for a reader like me, who requires historical fictions and their writers to be smart, or at least smarter than me. If you’re a writer and you want to bring old legends and ancient creatures to contemporary times, then at least make them interesting. The least you could do is make them a little frightening and somewhat creepy because, after all, these are monsters. Vlad Țepeș was a horrifying person when he was alive, and his legend as the Impaler is an echo and reminder of who he was. One does not “achieve” the name “the Impaler” and become a legendary monster that lives on in modern horror stories by feat of imagination alone; there’s actual history that shows the sort of bloody monarch he had been. 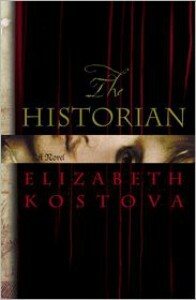 What Elizabeth Kostova does to Vlad Țepeș is similar to what urban fantasy writers have been doing to vampire tales in recent years: she sanitizes him by romanticizing his history and nature and presents him as a “stranger” with a huge secret living quietly among us. This is a huge disappointment to me not because it’s simple and naive, but because it brings up questions like why would he do that? what’s to gain by living among humans? Unfortunately, the story leaves me with more questions than answers, but none I’d like to explore further. Another huge disappointment is this book could have been a great contemporary horror story or even as urban legend, and maybe in the hands of a stronger writer who understands suspense and thriller, it would have been something chilling. The problem lies in the focus of the book being on research and setting up events for a Dracula figure that isn’t even a little bit intimidating. I think that’s what bothers me most, that it’s an attempt to bring Dracula to contemporary times, but the elements of horror and suspense are missing, and so the result is a long-winded lackluster tale about unraveling family histories. Let’s go back to the beginning when things started out with a promising set-up, but then got out of control half way through the story. An unnamed narrator stumbles across her father’s journals, letters, other notes, and a strange looking leather-bound book. As she reads these documents, she delves further into a “huge” secret about an ancient “evil” in her family historical papers. She then sets out to track her father’s travels across Eastern Europe and North Africa in search of both her parents and a mysterious stranger. During the quest, she meets “interesting” characters and comes across another familiar-looking leather-bound book, similar to one her father has (there’s something special about this book, I just know it!). Then she stumbles on a series of mysterious bloodless deaths and correctly suspects they’re somehow related to her search for her parents and the mysterious stranger. So she sets out to solve all of these interconnecting mysteries, which she does in the end. Sort of. Not to my satisfaction though. Too many coincidences, convenient explanations, and loose ends are left in the wake. The first two thirds of this book is told through journal entries, travelogues, letters, and notes from two POVs, the narrator’s (present time) and her father’s (past). The last third is more action-packed as the mysteries come to a head and the main characters finally come face to face with the Impaler himself. Much of this book is padded with set-ups, background information, historical research, and travelogues, and surprisingly though, this much isn’t a bad read at all. I rather liked the travelogues and train rides through Eastern Europe. However, since there isn’t much exposition of useful information, the narration is disordered which leaves the plot disjointed and hard to follow at times, but the prose is OK. I read much of the book while on a train myself and was able to enjoy the long travelogue-like descriptions of Eastern Europe and North Africa. What I didn’t enjoy was how dull and stale the central mysteries and the narrator’s family history were. A plot of conveniences and a cast of boring characters make for a terrible mystery and an even worse “love story.” Did I mention there’s a love story in this mess? Though unconvincing as it may seem, readers are supposed to experience the narrator’s parents’ “epic” love and deep devotion to each other. It’s the epic love story of Helen and…what’s-his-name, the unnamed narrator’s father. Helen is her mother, but we don’t find that out until much later in the book, far past the point where I decided to abandon ship (but I didn’t obviously…). At no point during the read did I feel a sense of dread or foreboding because at no point did I care about the narrator’s epic quest or lineage or how both are tied to Vlad the Impaler. I read on simply to get to the end of the book, that was all, and I was only mildly interested to see how Kostova wrapped up these meandering plot lines. Just as expected, she wrapped things up in a predictable fashion, by having the final confrontation be a stand-off at a cliff-side cemetery, you know the famous one where the Impaler is buried (supposedly). Although expected, the ending gave me the most WTF-feeling I’d had in a while. It was as though I couldn’t imagine or understand how a writer could fathom a final confrontation such as this one to be enough to wrap up this huge meandering story. I still have no idea how certain events unfolded because they were never explained enough; things just happened by sheer force of coincidence. How convenient for everyone. In 2007, this book almost become a movie, but (un)fortunately, a deal couldn’t be reached and so things fell through. As strange as it is for me to say, especially after writing such a scathing review, this story might turn out better as a movie. If the focus is on suspense and horror, it could be an interesting “modern-day” Dracula flick. Cutting out the first half of the book might help to intensify the search for Dracula. It couldn’t hurt, anyway.